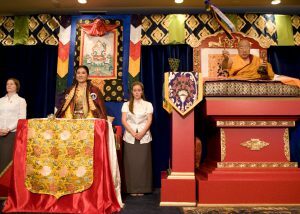 In honor of this anniversary, we offer memories of this special weekend celebration in Halifax, along with an article written by the Sakyong Wangmo about her relationship with her grandmother. Were you at the empowerment ceremony? We invite you to share your own memories in the comment section. Watch the video of the empowerment ceremony: click here. Read more articles from the weekend of festivities in 2008: click here. On the occasion of her empowerment, the Sakyong Wangmo shared intimate memories of her life and her grandmother, Mayum Palden Tsomo. The following article was written by the Sakyong Wangmo and appeared in The Dot. To view the original article, along with other stories from the empowerment, please click here. The year is 1992. It is 4 o’clock in the afternoon and we are all seated in the courtyard of the Ripa house in Orissa, India, our home in exile for the last forty years. Everyone in our family is here; some have come from far distances. The air is clear and fresh in spite of the wind. Standing in rows, the mango trees are in full bloom, promising every shape, color and variety of mango. The tamarinds and papayas have blossomed, perfuming the air with their fragrance. We can hear cows mooing far away. Birds are sending their sweet melodies in all directions, as if waiting for the rain to come. The Indian color festival Holi has just ended, and we are looking at the beginning of summer. My momola (grandmother) is seated on the couch, surrounded by the rest of our family. In the Ripa household, everyone is usually busy during the morning hours, as people from all parts come to pay us visits—some to see Rinpoche, some to see my grandmother, and some to see my mother. But afternoons have always been a time for us to gather, share our experiences of the day, and sip hot tea together. However, the reason for today’s gathering is different; it is not a happy occasion. For the last year, my momola has not been well. She has probably been sensing that her time is coming soon, although she is not displaying any signs of pain. She still looks graceful and caring as she patiently listens to everyone and advises us as well. My momola was tall and strongly built, with a sharp nose and keen eyes. She parted her hair down the middle, at times plaiting it and at others simply making it into a bun. In her youth she would wear traditional Tibetan head ornaments, which were made with precious stones. Due to their weight, they had left an imprint on the surface of her head in the middle where she parted her hair. She always wore a chuba with a full-sleeved honju, a typical dress for Tibetan women. My grandma was very gentle and kind. Her presence always gave a sense of splendor to the people nearby. She had the compassion of a nurturing and caring mother, and the wisdom of an enlightened spiritual friend. She saw life as a living practice of dharma. Our sangha communities—both lay and ordained—revered her deeply. Everyone called her Mayumla (the mother). Mayumla was well learned in both the dharma and in mundane matters, yet she carried an enormous sense of humility. Her devotion and trust in the buddhas, the teachers, and their precious teaching was absolute. She would begin her day with a huge practice prayer book before taking part in the affairs of the lhabrang (a lama’s household)—attending visitors and taking care of her beloved grandchildren. Then she would return to her room and continue with her practices. No matter how busy she was, my grandmother would always finish her day with practice. For Mayumla, there was no difference between personal practice and daily life. She loved to indulge herself by preparing breakfast for us. It gave her immense joy to set the dining table with her Tibetan bread, yogurt, butter tea, and some side dishes. She would often join us, but usually only when we finished, because she wanted to serve us, making sure that every one of her grandchildren ate to their fullest. This memory makes me very nostalgic for her immense love and care, which was never partial. In fact, Mayumla was my first teacher. She taught me to read and write Tibetan. She was very strict while teaching me, observing me well and with patience. If I pronounced the words incorrectly, she would pinch me. But I gladly received every pinch because she would often make it nice afterwards with some presents. Life in exile comes with enormous challenges and very little comfort. My grandmother had lost her country and suffered a tremendous amount of hardship and personal loss, but she nurtured no hatred or anger against the Communist aggressor. Instead, she chose to focus her mind on finding a meaningful purpose in life, making the best of all she encountered, without losing dignity or grace. During all the ordeals that came with starting life anew in exile, she never stopped caring for others. Her patience and determination always amazed me. One morning a visitor from faraway brought gifts for Mayumla. As soon as the visitor left, she gave the gifts to people in need. When some younger members of the family showed disappointment, she said, “If you give with joy, no matter how small the gift, your heart will expand. You will always experience great joy. Giving in such a way will make you richer, not poorer.” Later that very day another visitor arrived with more gifts. This experience made a lasting impact on me because it made me believe in the joy of giving. In fact, my grandmother was a living example of giving with joy. Mayumla was very careful about eating meat, advising people that if becoming a total vegetarian was difficult, then they should at least refrain from eating small animals, because then there would be so many small lives on one plate. This was sensible and practical advice. Mayumla would sometimes counsel and help heal troubled families. She was always able to sow a seed of contentment and reconciliation by imparting very useful and practical family wisdom and values. She would often speak to us about how a family staying together is a positive thing. She was happy to see large families and happy to entertain them. She was indeed the pillar and foundation of the Ripa family. 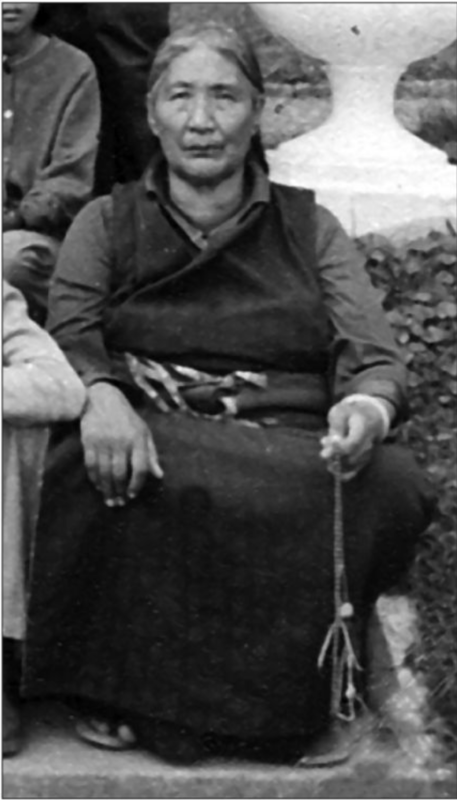 Back in Tibet, Mayumla had been born as Semo Palden Tsomo. She was a favored child of her grandfather, Drubwang Shakya Shri, one of the most celebrated yogi-saints of the nineteenth century. Though she enjoyed the life of a princess, she was brought up strictly under his spiritual care. She told us many beautiful stories of her time with him and her family. Once when Drubwang Shakya Shri was traveling to Lhasa along with caravans of his students and retinue, they camped for a night on the Ripa estate, where the supreme head of the Ripa monasteries and Ripa dung gyu (family lineage), Jigme Tsewang Chokdrup, received them. Before departing for Lhasa the next day, the famous traveling master told my future grandpa, “Though our meeting has been very brief, the future will bring a long-term commitment that will be very useful for your lineage.” The Shakya Shri’s prophecy was fulfilled much later with the marriage of Semo Paldem Tsomo to Jigme Tsewang Chokdrup. Thus two great families merged as one. My grandparents had six children, among them my father Tertön Namkha Drimed Rinpoche, the current head of the lineage. That the Ripa dung gyu continues to flourish is, in fact, the greatest contribution of my grandma’s life. It is heartening and very encouraging to see her traditional yet practical wisdom continue to reverberate in my mother. I guess that’s how mother lineage transmits from one generation to the other. So it is with heavy hearts that our families are here today, basking in the afternoon sun in the courtyard of the Ripa house in Orissa. My grandma is the center of everyone’s attention. I begin to observe every bit of her—her hair, nose, mouth, hands, clothing and posture. I am used to seeing these, yet I have a sinking feeling that this may be the last time I will look at her closely. Just then, in a hushed tone, my uncle, Anzin Rinpoche, tells us to be extra vigilant during the night, as tomorrow is a full-moon day. Because it is so auspicious, great practitioners often choose it as a day for passing away. Since my grandma’s health began to fail, my sisters, mom, my aunts, and I have been taking turns sleeping beside her. We siblings used to fight for this privilege, because there is such joy and warmth in sleeping with her and we all love her so much. But on this particular night, we don’t sleep very much. We keep observing her, but she seems calm and sound asleep. The day breaks and the sunrises beautifully. At eight in the morning, at her request, we bathe my grandmother and help her put on fresh clothes. As we being to fix her hair, she suddenly starts correcting her posture as if she wants to meditate. Then, without any pain or discomfort, she passes away. My momola remained in this meditative state for three days, during which her body shrunk to one-third of its size. According to the teachings of the Great Perfection, this is the sign of having obtained a rainbow body, the highest form of accomplishment. Mayumla’s life has been a great teaching for those who know her. She is forever enshrined in our memory as the perfect embodiment of a woman of wisdom. I feel extremely fortunate and grateful to have met her, especially to have been born so close to her in this life. Today, when I embark on my own journey in the world, she remains my greatest source of strength, support and inspiration. Eh Ma Ho! Cheerful Anniversary, Your Majesty! We Love You!! Your Majesty, you are a precious jewel and a shining light of wisdom. Your example of genuine strong femininity inspires me and guides us all. Best wishes and love on this auspicious anniversary of your enthronement. 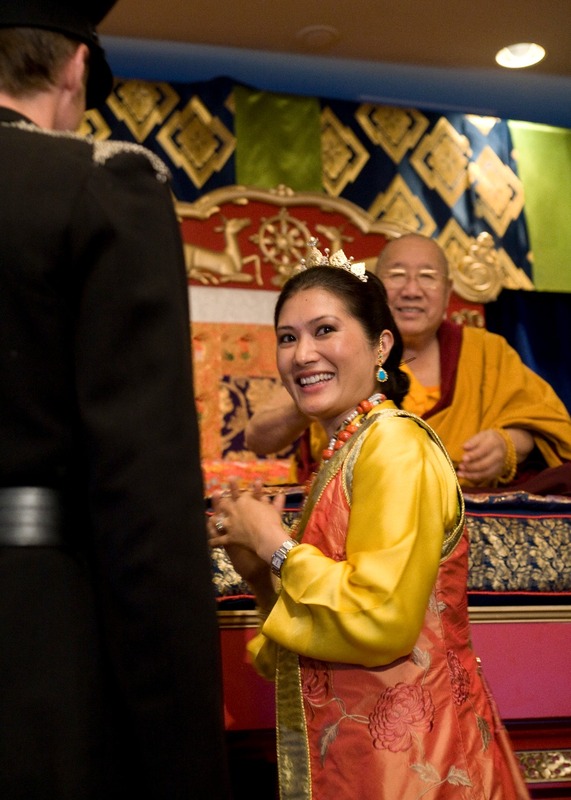 Whenever I remember the Royal Family of Shambhala I feel strength, tenderness, and openness. Your Majesty, when I think of you I am reminded of beauty, elegance, grace, discipline, love, toughness, dedication, humor. I don’t know if you have ever heard of Popeye the Sailor but when he eats a jar of spinach his lungta is raised and he is 100 times more powerful than the moment before. In the same way, when I think of you and am reminded of so many noble qualities, I feel my lungta raise and that those noble qualities flow through my royal blood as well. Thank you so much for taking and holding your seat as the Sakyong Wangmo of Shambhala. We are so fortunate that you are here. May you set an example of what a true warrior,humanity ,and life means, irrespective of gender, because I believe only we women have the power to bring the world together or tear it apart. Your silence in this chaotic time is a prove of your strength and dignity, and I know that when the time comes you will ROAR and the whole world will hear! Wonderful to remember and celebrate this event, and our fortunate gift of Khandro Tseyang our Sakyang Wangmo to our community. Gentle and tough. I wish Sakyong Wangmo, Semo Tseyang la, all the best and success on 10th Anniversary! She represents goodness, grace, dignity, fearlessness, honesty and strength that stands strong, confident and unflinching in the storm of the world. She is one of her own kind that will lead not only Shamhala Community but humanity from the darkness of jealousy, hatred, attachment, ignorance and arrogance.